Milan has inaugurated two new squares during last week’s Milan Green Week. Both interventions aim at regenerating an area of the city in full evolution and at making life in the city greener and better. Mayor Giuseppe Sala was at the inauguration the new Piazza Olivetti, a 13 thousand square meters square created as part of the Symbiosis project. As part of Sharing Cities, Symbiosis aims to create a smart neighbourhood with almost zero emissions in the Romana-Vettabbia area, in order to respond to main environmental challenges and improve the daily life of its inhabitants. Piazza Olivetti, a former industrial area, is set to become a new green agora for all citizens with 45 trees, water tanks, a wild garden with grass and spontaneous vegetation, benches, fountains, wi-fi system and 2 multimedia totems to give useful public information to citizens. "As of today the district has a new place for social interactions and aggregation” - says the Councillor for Urban Planning Pierfrancesco Maran. 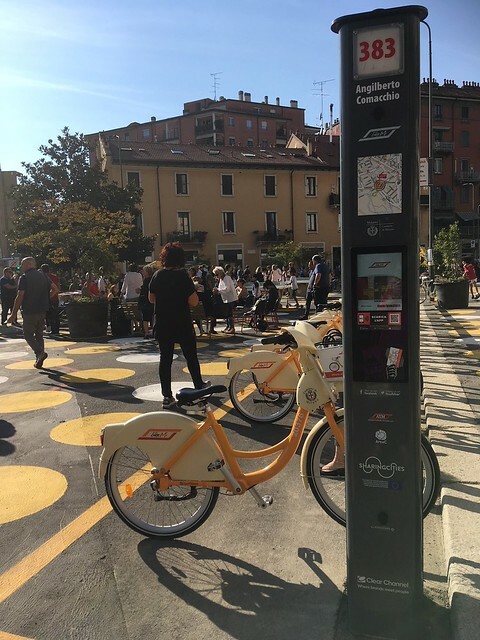 Piazza Angilberto II, is the result of a co-creation process with Milan’s citizens and has resulted in the creation of a square that is safe for pedestrians and designed so that citizens can enjoy different activities (e.g. play ping pong at the ping pong tables). Sharing Cities contributed to the new square with the installation of an additional bike sharing station (Bikemi) going hand in hand with the nearby and newly built bike path in Via Comacchio.